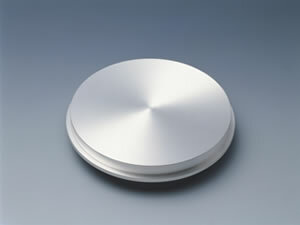 Sputtering Target for Optical Discs. We can offer Al- and Ag-alloy sputtering targets for DVDs and Blu-ray discs used as reflection or semitransparent layers. The GBD and GD series are our original products, and the produced films have high reflectivity and corrosion resistance. They had been used by many customers. Blu-ray discs have a data storage capacity that is approximately five times higher than DVDs, and are used for full high-vision recordings. Although the disc structures and the recording methods have variations due to industrial formats, the data reading is undertaken by measuring the reflected signals from an irradiated laser beam. Therefore, the reflection layer needs to have a high reflectivity and a long lifetime. To control the quality of the reflection layers that have only 100nm thickness, sputtering techniques are widely used to deposit the reflection layers on substrates.